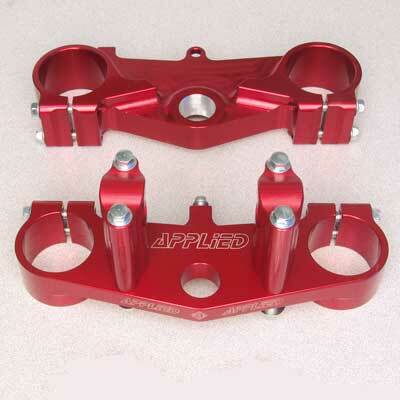 This Factory Clamp set has all the benefits and quality of our big bike model clamp sets. The double pinch bolt set, improves bike performance, with the addition of more surface clamping area, for less fork flex. Reversible offset bar mounts, allow a far more aggressive bar position, enabling the rider to transfer weight to the front end with greater ease. With strength many times that of stock clamps and your choice of colors, this set should be the first purchase for your new mini. The Factory Set comes complete with an upper and lower clamp, reversible bar mounts and all the necessary hardware. Made in the USA with a lifetime warranty to the original purchaser!